The Bay Area has been truly blessed by the radio talent that we’ve enjoyed over the years. Whether your tastes run to Frank Dill, Don Sherwood, Al Hart, Sly Stone, M. Dung, Tall Tom Campbell, Jim Dunbar, Merv Griffin, Dr. Don Rose, Jim Lange, Bobby Ocean, Red Blanchard, Tom Donahue, Dave Diamond, Alex Bennett, Gene Nelson, Renel, Art Linkletter, Don Bleu, Super Snake, Bill King, Les Malloy, Bwana Johnny, Buddy Baron, Ronn Owens, Jumpin’ George Oxford, Tommy Saunders, Mel Venter or any of the thousands of voice that have graced our local airwaves, the Bay Area Radio Museum is continually creating new exhibits that feature the men and women that you loved to listen to, and some that you may never have had the opportunity to experience before. We hope you enjoy these classic broadcasts from voices both famous and forgotten. EXCEPTION: In cases where a radio personality used only a nickname on the air, look under the first letter of that name. EXAMPLE: Look under R for Dr. Don Rose; look under B for Bwana Johnny or F for Father Harry. PLEASE NOTE: Exhibits listed below as “Audio Only” do not currently include text or images with the presentation. * — Included in The Complete KCBS Collection. * — Included in KYA: The Sixties Collection. * — Included in KFRC: The Big 610 Collection. * — Included in KMPX: The Big Band Years Collection. * — Included in the Complete KYUU Collection. * — Included in The KPEN Collection. * — Included in The Complete KEWB Collection. ** — Included in KYA: The 1970s Collection. * — Included in The Tom Campbell Collection. * — Included in KSFO: The Sound Of The City Collection. * — Included in KYA: The Seventies Collection. * — Included in KMPX: The Big Band Era. 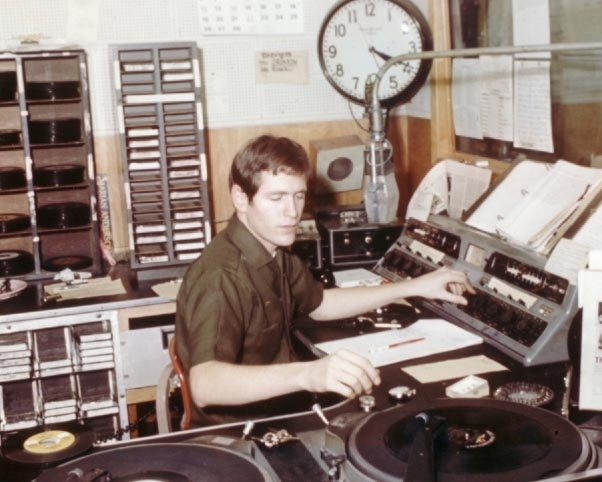 * — Included in The Complete KGO Radio 810 Collection. * — Included in KNEW: The 910 Collection. * — Included in The KSOL Soul 145 Collection. * — Included in The History of KOBY. ** — Producer. Exhibit includes comments by Mr. Davis. * — Included in The KGO News/Talk 810 Collection. 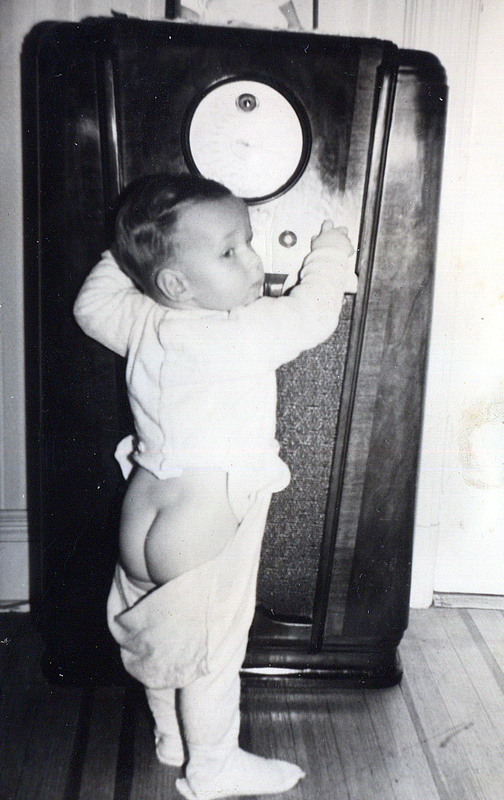 Photograph: Chris Has Loved Radio Since an Early Age! * — Included in The KEWB Collection. * — Included in KYA: The 1970sCollection. * — Included in The KDIA Collection. ** — Included in KYA: The Seventies Collection. * — Included in The History of KWUN. * — Included in KYA: The 1970s Collection. * — Included in The K-101 Era Collection. * — Included in The Bay Area Radio Museum Sports Page. * — Included in The KLIV Collection. * — Included in The Complete KMEL Collection. 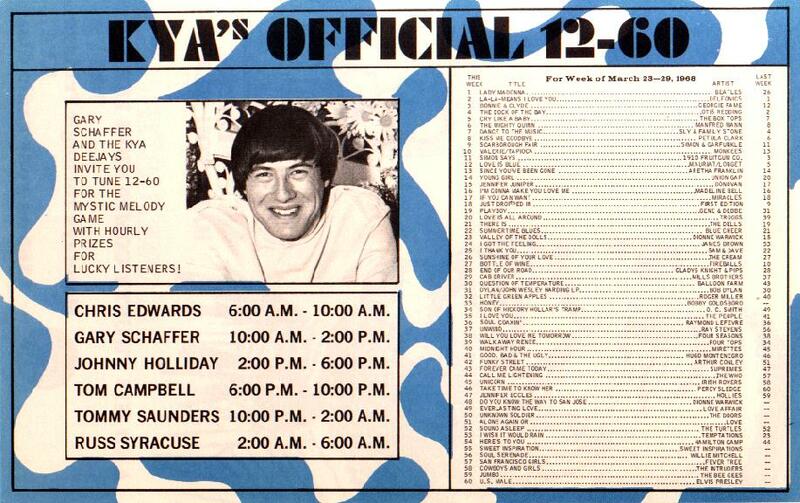 * — Included in the Complete KLIV Airchecks Collection. * — Included in KSFO: The Golden West Collection. ** — Included in The K-101 Era Collection. * — Included in The KSAN & KSOL Collection. * — Included in KSAN: The Jive 95 Collection. * — Included in The Big 610 Collection. ** — Included in The Complete KMEL Collection. ** — Included in KNEW: The 910 Collection. * — Included inKYA: The Top 40 Years Collection. * — Included in the Dr. Don Rose Collection. * — Included in the Complete KDIA Lucky 13 Collection. * — Included inKYA: The Sixties Collection. * — Included in The Don Sherwood Collection. KSFO: The Golden West Collection. Steve Jordan; not the KFRC program director (a/k/a Hal Martin). * — Included inThe KSOL Soul 145 Collection. * — Included in TheBay Area Radio Museum Sports Page. * — Included in KITS: The Complete Airchecks Collection.